I’m sure you’re just thinking that waking so infrequently could have been said to have been getting a bit dull, so your exercise this past week of “let’s wake the big ones more often” has been especially welcome. It’s been interesting to see the world through the sleepy fug that waking every hour brings, so thanks for that! And to you, littlest one, I must say I really appreciate how you’ve waited until you’re almost 12 weeks old to experiment with waking more often. After all, knowing that you CAN go 4 or even 5 hours between feeds at night makes it even more delightful when I get to see your beautiful face more often than that. I know this is just a recent experiment, but I think we’ll all be happier (or is that just me?!) when you go back to your lovely blissful previous routine. So, my darling children, thank you for your consideration and thoughtfulness, but I think maybe we should try to see each other a bit less between the hours of 7pm to 7am. It’s not you, it’s me, and to be honest that way you’ll have a much nicer set of parents the rest of the time. Deal? 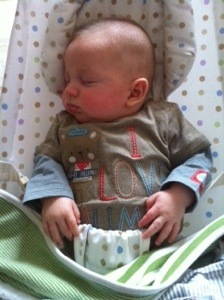 Trying to win me over with his “I love Mummy” t shirt whilst sleeping LIKE A LOG during the day! This entry was posted in Alexander, Elliot, Family, Letters, Motherhood and tagged lack of sleep, zzzz. Bookmark the permalink. Oh yes, embarrassing photos at 18th and 21st birthday parties are already planned 🙂 thanks for your comment! You have my sympathies, those first few months of sleep deprivation are like a war-zone. Well done on keeping your sense of humour! Your son does look exceeding cute when he’s asleep. No doubt about it, those early few months are like something out of a war zone! Sounds like you’re keeping your sense of humour though, which is a huge achievement. And your son does look outstandingly cute when he’s asleep.